Help! I need to stay on the Bandwagon! Sound familiar? I have said them both. I think its so easy to say the first statement when your in the groove of eating and looking FABULOUS! And then there are the days your so hungry and everyone around you is eating food you probably wish you had. Even the scent of fast food smells yummy! Well I have definitely been both on and off the bandwagon after a show. Let me tell you once your off of it, it can feel like everything is downhill from there. You don’t have your normal self-confidence, no motivation to work out,depressed, and you start feeling sluggish and tired. After competing in 11 shows now ,I have realized for me its important to get back on track quickly before I start craving more and more junk. I always have my bad meal the night of the show and Sunday. When I get back to reality Monday I take a day to rest my body from working out and hydrate with some coconut water. This is when I start to eat clean again and normal portions. that way my body is getting clean food but I don’t feel like I am depriving myself. If I continue to eat junk then my body craves more junk and thats when it all goes downhill. You keep telling yourself your going to get back on track tomorrow but you can’t stop eating because your body is reacting like its never tasted food before. If you immediately get to the gym work out, sit in the sauna, and just cleanse from those toxins you will feel so much better. Then you can save your cheats for treats. What has helped me get back on track besides setting another goal? Its changing your relationship with the food you are eating. You have to get out of the mindset that you only eat clean for your competitions or better yet a certain goal. Yes setting a goal is very helpful when you are trying to cut down for a special event, however you should remember that you are eating this way for your health and for energy. I know that realistically you may not want to eat the same food every single day after a show but there are many other vegetables, lean protein, and whole grains out there besides the same ones you continuously eat. The key is to be prepared just like you are when your prepping. Instead of just cooking the same meals on Sunday try new recipes and prep those. For a realistic lifestyle of eating clean its important to have a balance of food and not carb deplete or not eat enough. Still continue to eat 5-6 meals a day every 2-3 hours. 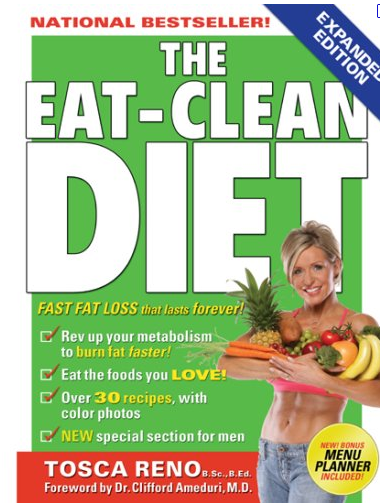 Before I competed in my first show I learned how to be a clean eater by reading The Eat Clean Diet book by Tosca Reno. Luckily I got the practice of bringing my little lunchbox cooler with me everywhere and preparing my meals Sundays. If you don’t know how to eat clean or what to do then I highly recommend getting the book. Also if your clueless on working out and want to know more about supplements check out http://www.bodybuilding.com and check out the Find a Plan section. You can follow different diet and workout programs to meet your goals.